Why Buy a DIY Kit? Up to $1500 OFF in Discounts - Only at our Factory! Get Bonus $200 Off - Order Today! "The Best" Do-It-Yourself sauna kit provides the easiest way to build your own sauna! With over 44 parts, an elegant sauna will be built with the right materials, the perfect lengths of high-quality cedar and great instructions. Even a first time DIY sauna builder can make a beautiful cedar home sauna with "The Best" home sauna kit. "The Best" DIY sauna kit has the finest features and the best quality of any sauna kit on the market - along with low prices from the sauna factory. "The Best" cedar sauna kit has the best features! - Get all 24 upgrades - our Most Popular Sauna! Up to $1500 Factory Discounts - Only at our Factory! Call to order or get a quote - take advantage of our low low factory prices! "The Best" DIY includes all of our 24 upgrades. "The Best" sauna kit is also our best-seller. "The Best" sauna kit has all the features you would ever want in an elegant home sauna. The purchase of this DIY sauna kit saves you $3,200 to $3,900 when you do it yourself. You supply the insulated stud walls - we supply the 44 sauna parts that you need. Customizing is easy - our factory has customized sauna kits since 1974. Our sauna prices are low - our volume as a sauna factory allows lower prices! All of the wood used in "The Best" DIY sauna kit is Western Red Cedar, well-known for its rich colors and its suitability for sauna building. >>... Learn More - Why Cedar is the Best Sauna Wood. This kit is also called: a sauna material package, a home sauna kit, a D-I-Y sauna kit or a pre-cut sauna kit. Over 44 parts are normally included - for the perfect material list and for simple building. Up to 24 Great Upgrades are Included!! Sauna Heater - a 100% stainless-steel Special Edition SE heater correctly-sized. Sauna Controls - our best DEC Digital Electronic Control. Door - our most popular door: #1 full window door. Most customers want this door. Other doors are available. Door Jamb - made of 1x6 clear cedar. Includes 2x6 thresh hold. Includes universal hinging for left or right side hinges. Cedar door jamb is shipped K.D. Tongue-and-Groove Cedar - our premium best grade is made of the thickest-possible boards (11/16" thick) and kiln-dried to a low 9-10% moisture content to prevent shrinkage. We ship full-length T&G boards so there are no joints. The thicker T&G boards are much easier to install - the sauna feels better with thicker wood. Benches - two-tier benches are made of the thickest 2x4 for strength. If room, a 3rd L-bench is optional. If room, 4 benches are optional. Bench 2x4s are milled for a smooth furniture-grade finish! Bench Supports - the benches are installed on the strongest bench frame system ever designed so all of the weight is on the floor! Not on cleats on the wall! See the image on the left! Accessories - the bucket, ladle, thermometer and even the hygrometer are included as Bonus FREE Accessories. Aluminum Foil - the heat-resistant vapor barrier is included. Lights - 2 sauna-grade vapor-proof lights are included - to be surface mounted. Duckboard Floor - a cedar duckboard floor is optional for the walking part of the floor. Hardware - 2 louvered vents, coated screws, galvanized nails, etc. Instructions - the best instructions are supplied for your project. Over 65,000 sauna customers since 1974 agree: we supply great instructions! FACTORY DISCOUNTS - Up to $1500 OFF in factory discounts! DEAL #2 - Get $200 Off Bonus - Order Now! DEAL #3 - FREE Accessories - Bucket, ladle, thermometer (Value $157). 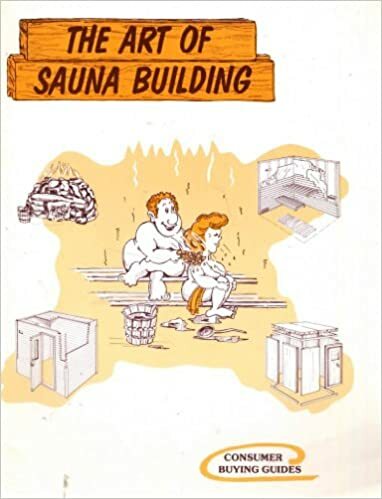 BONUS - our best-seller book, The Art of Sauna Building. Over 65,000 saunas have been built using our sauna book as a guide. Now acclaimed as "the best sauna building bible" by industry experts, it is well-illustrated with step-by-step instructions. 24 Upgrades Worth Over $900 - are included in "The Best" sauna kit. >>... Learn More - Details: Anatomy of a Sauna Kit. ... Read More - Recent Customer Comments! Save up to $1500 - Order Today! "The Best" kits provide more choice of kit sizes, fully loaded with all the options and then some ... our best quality, best value and most popular. You are here now. 24 Popular Upgrades - With these upgrades, you get our best features, best quality and best value. Get $900 worth of Upgrades - For only $400 on most sizes. This is Our Most Popular Sauna Kit - "The Best" sauna kit is ordered by most of our customers. Instructions - the best-seller book, The Art of Sauna Building - is included for every project. Inside Height - upgraded to 84" height (7'). Sauna Heater - upgraded to 100% stainless steel SE heater (the popular choice by most customers). Control - upgraded to the popular #1 DEC Digital Control - for accuracy and reliability. Door Jamb - upgraded from thin 1x5 mahogany to matching 1x6 cedar. Door Handles - upgraded to stylish 23" crossbar style (with #1 door). Useful as a towel bar too! Door Casings (2 sets) - upgraded to stylish colonial style (1 set for inside and 1 for outside). T&G Boards - upgraded to our thickest 11/16" - all full length cedar boards - for durability & appearance. Benches - bench tops upgraded to thicker 2x4 for greater strength (using our thickest 2x4). Bench Frame Supports - included for stronger benches - the benches will now support any weight. L-benches - 1 or 2 L-benches are optional where room permits. Duckboard Floor - optional - to cover the open walking part of the floor. Light Fixture - included - 2 light fixtures - for wall or ceiling mount. Vents - included - 2 adjustable vents - the outlet vent is a premium all-wood adjustable vent. Heater Guard - included - made of extra-thick cedar rails for safety. Corner Trim - included - for wall and ceiling corners. Spare T&G Boards - extras are included - just in case. ... Learn more - Details on Options and Upgrades. Sauna Kit Prices - The sauna kit prices shown include all the sauna parts and the sauna heater as described above. Packaging and crating are extra when needed. Shipping Charges - Are extra. Our shipping charges are very reasonable because of our volume. Just email us your postal code or zip code for a shipping quote to your door. Taxes in U.S.A. - No taxes are charged when shipped to U.S. destinations. Payable in USD Dollars. Learn More - our Anatomy of a Sauna Kit explains how the parts in a perfectly engineered sauna kit work. Checklist of Options - these 24 upgrades are included in "The Best" D-I-Y sauna kit at no cost to you. Why Cedar is the Best Choice in North America - sauna builders in the USA and Canada benefit from the Western Red Cedar trees that grow on our West Coast. >>... Learn more - How Cedar is the Best Choice for Building Saunas. Preparing for Your Sauna Kit - here's a handy checklist to help with planning. Building Details - more information about building your own sauna using a kit. Just call us. - Or email us. You'll be glad you did! To Contact Us - Call us or email us today. "Thanks for your great customer service & for making an amazing product. Our outdoor sauna is built and we are using it daily & loving it. It was a pleasure working with you!" This Book Makes it Easy! Will you be enjoying this sauna soon? 1997-2019 © All rights reserved. Home Sauna Kits - Since 1974.